Social view on Second Language Acquisition (SLA) has influenced the development of teaching methodology. Communicative Language Teaching (CLT) which is based on Communicative Approach has been widely used as a teaching method troughout the world. It is reasonable to say that the CLT has widely replaced the use of Grammatical Approcah that has been applied before. Therefore, in this short article, we are going to examine the CLT, theory behind it and its practice in the field of language teaching. 1. How do sociolinguists view second language acquisition? 2. What is the implementation of the view on English teaching field? The discussions about second language acquisition are always initiated by the questions around what exactly the L2 learner comes to know, how the learner acquires this knowledge, and why some learners are more successful than others. For instance, linguists answered the questions by grammatical approach, which believe that the goal of second language acquisition lies in gaining grammatical competence. Furthermore, learners gain this competence through the exposure of grammar. Thus, a successful learning is resulted from an adequate exposure of grammar. In contrast, a less successful learning is resulted from the lack of the exposure. However, sociolinguists offer answers for those questions from their social perspective. In spite of believing that the goal of English teachings lies in the achievement of grammatical competence, they believe that a successful learner is the one who is successful in communication. In English teaching field, it is said that a successful English teaching is achieved when the learners have gained communicative competence. Moreover, the process of language acquisition is mediated by input and interaction. The more one is involved in live communication with L2, the more successful he/she will be in the process of learning. The variation also occurs in L2 learners, some learners are more successful than others. In explaining this phenomena, sociologists argue that variable feature occurs in the production of any one speaker (native or language learner) depends largely on the communicative contexts in which it has been learned and is used. Furthermore, The extent of using English in communication becomes a factor influencing the acquisition of L2. Elements of language form and function associated with the variable element. In the examples given above, for instance, the phonological variable [ŋ] in coming is more likely to be used before a word which begins with a back consonant or before apause, and the variable [n] in comin’ is more likely before a front consonant. The part of speech canalso be a relevant linguistic context, with production of [ŋ] most frequent in one-syllable nouns such as ring or sing, and [n] in the progressive form of verbs, as in I’m workin’. Factors associated with the amount of attention which is being given to language form during production, the level of automaticity versus control in processing, or the intellectual demands of a particular task. In learners’ production, for instance, the copula of that is a big book may be produced during a formal second language lesson in in a writing exercise but omitted in informal conversation even at the same point of L2 development. Similarly, the variable [ŋ] is more likely to be used by L1 or L2 speakers when they are focusing in their pronunciation in a formal setting thatn in casual conversation. Features of setting/situation and interaction which relate to communicate events within whicih language is being produced, interpreted, and negotiated. These include level of formality and participants’ relationship to one another, and wheter the interaction is public or intimate. Such features interact imprtantly with the amount of attention that is paid to language form, as illustrated above for the probability that the copula or [ŋ] versus [n] will be produced, or that the difference among see, saw, and have seen will be consistently observed. It is obvisous that input plays important roles in SLA. However, among disciplines of study, the role of input is still in dispute. As a matter of fact, followers of behaviorist learning theories consider input to form the necessary stimuli and feedback which learners respond to and imitate; followers of Krashen’s Monitor Model consider comprehensible input not only necessary but sufficient in itself to account for SLA; proponents of UG consider exposure to input a necessary trigger for activating internal mechanisms. Sociolinguists also have their own view on the role of input in SLA. They consider language input as primary “data” for essentially linguistic and/or cognitive process. In other words, it is the source of data which in turn is further processed in the interaction to gain more advanced knowledge. Furthermore, interaction is generally seen as essential in providing learners with quantity and quality of external linguistic input which is required for internal processing. Therefore, language input and interaction play important roles in the process of acquisition. In some learning contexts, language inputs are often modified to gain success in communication. The modification is intended to achieve meaningful communication, since it is considered primary in sociolinguistic’s view on language. Furthermore, the modification can be a simplified form of language, and it sometimes occurs naturally. In fact, learners with low proficiency will get difficulties in attending a communication where the speakers are natives and use a high grammar of language. In this regard, the natives will naturaly and automatically simplify the form of their language, so the learners will have better understanding on the language, and the communication will run meaningfully. All above descriptions about input modification show the regularity found in L2 learners’ language. As a matter of fact, some of the oral modifications may make acquisition easier, but all L1 and many L2 learners can succeed without them. Furthermore, modifications in written input which improve comprehension are similar for L2 and L1 students, but research on their effectiveness for SLA is quite limited. In sociolinguists’ view on SLA, interaction is generally seen as essential in providing learners with the quantity and quality of external linguistic input which is reqiured for internal processing. Thus, as stated earlier, the more a learner has a chance to communicate with the target language, the more successful he/she will be. Teacher : This is your assignment for tomorrow? Teacher : This is your assignment. Teacher : This is your assigment for tomorrow? Teacher : This is homework. Teacher : Rings. Tree rings. Teacher : How old are you? Student : Five old are you. Teacher : what did Ana do? Teacher : what did Ana do with the pencil? Teacher : Ana, don’t throw pencils. Teacher : substract, and write the reminder here. Student : what is “remain”? As like input, social interaction plays an important role in L1 acquisition: no children can learn their initial language by merely listening to tape recordings, radio broadcasts, or television programs. However, some other views argue that L2 learners can acquire a high level of competence without interacting with speakers of the target language. Therefore, the disscussion about the necessity of interaction is also in dispute. However, sociolinguists tend to see that the modification is necessary in teaching and learning contexts, since the core of every communication lies on interaction. Again, it is essential to provide learners with external inputs for internal processing. As stated earlier, communicative competence becomes the goal of English teachings. However, the term communicative competence itself remains unclear without examining another definition of the term competence from another field of study. For instance, Chomsky as a linguist defined competence as static knowledge lies in mind, a state of product that excludes any notion of “capacity” or “ability”. Furthermore, competence becomes performance when the competence is put in use. Therefore, he distinguished between competence, a static knowledge, and performance, an active use of the knowledge. Instead of seeing the competence as a static knowledge, the proponents of communicative approach believe that “competence” covers both the static knowledge and the active use of the knowledge. In addition, the term competence is also accompanied with the notion of communication. Thus, it is necessary to define the notion of communicative competence in a comprehensible definition. Accordingly, some models of communicative competence have been proposed in order to meet the comprehensible definition. Grammatical competence – the knowledge of the language code (grammatical rules, vocabulary, pronunciation, spelling, etc.). Sociolinguistic competence – the mastery of the sociocultural code of language use (appropriate application of vocabulary, register, politeness and style in a given situation). Discourse competence – the ability to combine language structures into different types of cohesive texts (e.g., political speech, poetry). Strategic competence – the knowledge of verbal and non-verbal communication strategies which enhance the efficiency of communication and, where necessary, enable the learner to overcome difficulties when communication breakdowns occur. The model shows us that competence is not merely a static knowledge, but also it covers an active skill initially known as performance. As a matter of fact, discourse competence is an active ability in combining language structures into different types of cohesive texts, while grammatical competence is a static knowledge about language code. Therefore, the model is comprehensive enough to explain the competence from sociolinguists point of view. One of the implication of the social view is a methodology so called Communicative Language Teaching. However, some teachers are often mistaken when asked what is CLT and how it is implemented in detail in a classroom setting. They often answered simply with group discussion. Therefore, we will examine in detail what is CLT and how it is implemented in a classrooom setting. According to Richards (2006: 2), “CLT can be understood as a set of principles about the goals of language teaching, how learners learn a language, the kinds of classroom activities that best facilitate learning, and the roles of teachers and learners in the classroom.” Thus, it is obvious that in defining CLT we need to observe each component above in order to gain a comprehensible definition. Therefore, we will examine them in turn. Knowing how to maintain communicationdespite having limitations in one’s language knowledge. Trying out and experimenting with different ways of saying things Of course, interaction is the backbone of the CLT, since the social view on language has become the backbone of language teaching and its most influencing perspective. The kinds of classroom activities in CLT are grouped in activities such as the use of pair work activities, role plays, group work activities and project work. These are discussed in the following discussions. The four components of CLT should be facilitated in a systematic way that accomodates those components in term of syllabus design. Thus, CLT has its own design of syllabus which varies based on its function. Several new syllabus types are proposed by advocates of CLT. These include a skill-based syllabus, a functional syllabus, and English for specific purposes. Identifying key information in a passage Advocates of CLT however stressed an integrated-skills approach to the teaching of the skills. Since in real life, the skills occur together, they should also be linked in teaching, it was argued. This type of syllabus is organized according to the functions the learner should be able to carry out in English, such as expressing likes and dislikes, offering and accepting apologies, introducing someone, and giving explanations. Communicative competence is viewed as mastery of functions needed for communication across a wide range of situations. Vocabulary and grammar is then chosen according to the functions being taught. A sequence of activities similar to the P-P-P lesson cycle is then used to present and practice the function. Functional syllabus are often used as the basis for speaking and listening courses. Differences in the need for particular skills ESP courses soon began to appear addressing the language needs of university students, nurses, engineers, restaurant staff, doctors, hotel staff, airline pilots, and so on. In an attempt to have a complete definition of CLT, we need to examine the activities categorized as communicative activities. 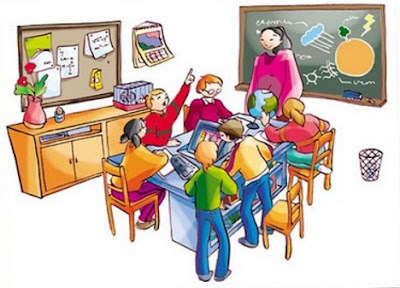 It is due to the fact that without a brief explanation of the activities, one can be mistaken in defining CLT, for instance, a teacher who simply considers CLT as a group discussion activity. Furthermore, group discussions cannot be easily categorized as communicative one, since they vary in its detail sequence of activities. The activities in CLT’s classroom can be seen as following particular patterns as like focusing on fluency, emphasis on mechanical, meaningful, and communicative practice, considering information-gap, and one so-called jig-saw activities. There are also other activities categorized as communicative ones as like task-completion activities, information-gathering activities, opinion-sharing activities, information-transfer activities, reasoning-gap activities, and role plays. One of the goals of CLT is to develop fluency in language use. Fluency is natural language use occuring when a speaker engages in meaningful interaction and maintains comprehensible and ongoing communication despite limitations in his or her communicative competence. Fluency is developed by creating classroom activities in which students must negotiate meaning, use communication strategies, correct misunderstandings and work to avoid communication breakdowns. Choice of language is controlled However, it does not mean that the teacher cannot use the accuracy activities at all. The accuracy activities can be used as a supplement for fluency activities. Therefore, teachers are supposed to use both of them in balance in order to gain more success in teaching and learning. Another distinction that some advocates of CLT proposed was the distinction between three different kinds of practice – mechanical, meangingful, and communicative. Mechanical practice refers to a controlled practice activity which students can successfully carry out without nececarily understanding the language they are using. Examples of this kind of activity would be repetition drills and substitution drills designed to practice use of grammatical or other items. Meaningful practice refers to an activity where language control is still provided, but where students are required to make meaningful choices when carrying out pratctice. For example, in order to practice the use of prepositions to describe locations of places, students might be given a street map with various buildings identified in different locations. They are also given a list of prepositions such as across from, on the corner of, near, on, next to. They then have to answer questions such as “where is the book shop? Where is the café?” etc. The practice now is meaningful because they have to respond according to the location of places on the map. Communicative practice refers to activities where practice in using language within a real communicative context is the focus, where real information is exchanged, and where the language used is not totally predictable. For example, students might have to draw a map of their neighborhood and answer questions about the location of different places in their neighborhood, such as the nearest bus stop, the nearest café, etc. An important aspect of communication in CLT is the notion of information gap. This refers to the gap that in real communication, people normally communicate in order to get information they do not possess. This is known as information-gap. More authentic communication is likely to occur in the classroom if students go beyond practice of language forms for their own sake and use their linguistic and communicative resources in order to obtain information. In so doing, they will draw available vocabulary, grammar, and communication strategies to complete a task. These are also based on the information-gap principle. Typically, the class is divided into groups into groups and each group has part of information needed to complete an activity. The class must fit the pieces together to complete the whole. In doing so, they must use their language resources to communicate meaningfully and so take part in meaningful communication practice.